Deb Allen and her husband Tyler, a Teach For Canada teacher, both work at Martin McKay Memorial School in Sachigo Lake First Nation. Deb was born and raised in Sydney, Australia, and completed a Bachelor of Arts from the University of Otago, working in finance for over a decade in New Zealand. Tyler grew up in Blue Mountain, Ontario, and completed a Bachelor of Education at the University of Otago in New Zealand, teaching there for several years. Deb and Tyler have both worked as snowboard instructors and once ran an off-the-grid fishing and hunting lodge on Manitou Lake. They moved to Sachigo Lake First Nation in 2017 when Tyler became a Teach For Canada teacher. 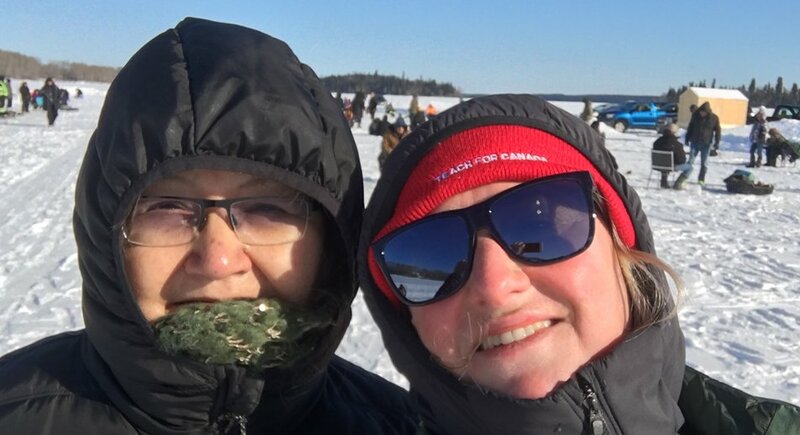 Deb documented their ice road adventure from Sioux Lookout to their home in Sachigo Lake First Nation this past February. 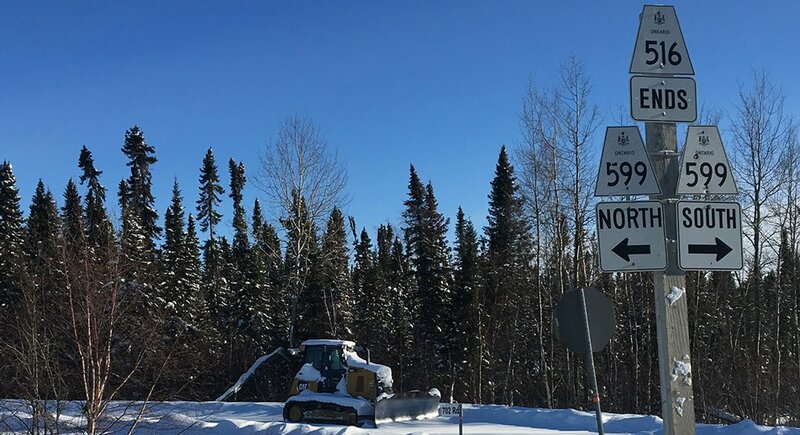 Ice roads are winter roads in the North that connect First Nation communities to permanent highways. In Ontario, more than 30 First Nations rely on winter roads for more affordable travel and to truck in supplies. They are open between mid-January until the spring thaw. 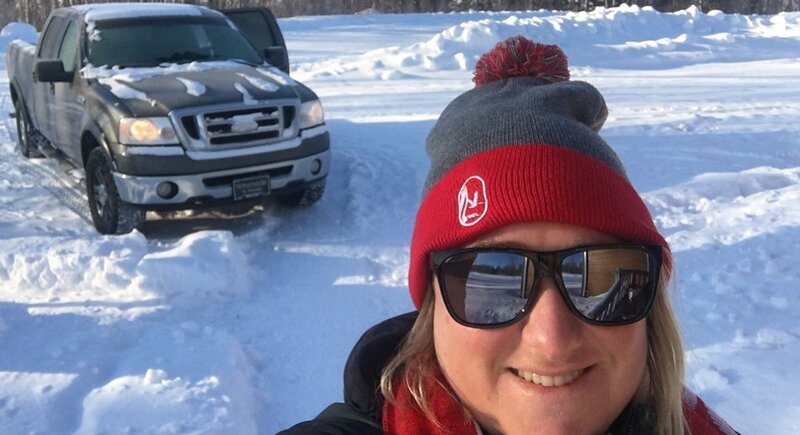 Deb Allen documented her and her husband Tyler’s journey on the ice road to Sachigo Lake First Nation. They gripped the snow with grit. Our aggressive truck tire treads kept Tyler and I stuck on the ice of the northern ice road. We set off on a Saturday morning in February from Sioux Lookout to drive to our Sachigo Lake First Nation home. 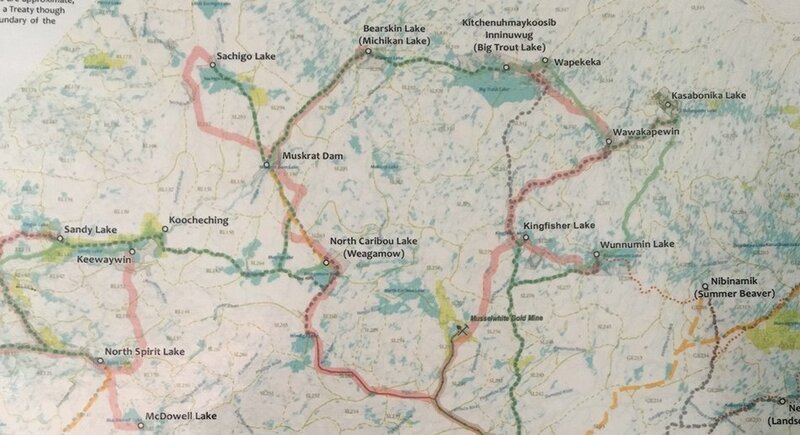 A paper map of the northern ice road to Sachigo Lake First Nation. Several community members were very concerned we wouldn’t make it and told us the story of a Northern Store manager who attempted to drive to Sachigo Lake First Nation but ended up in Wunnumin Lake First Nation, many kilometres east. 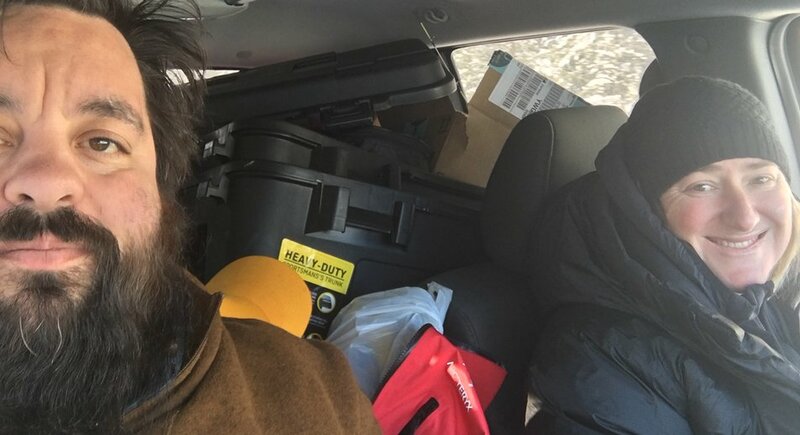 Deb and Tyler packed their truck and hit the road, leaving Sioux Lookout. However, we were not deterred. Based on valuable local information and two vague digital maps (which we found out later were out of date) we were optimistically confident we would make it. Loaded up with gear, gas, and gusto we left Sioux Lookout. 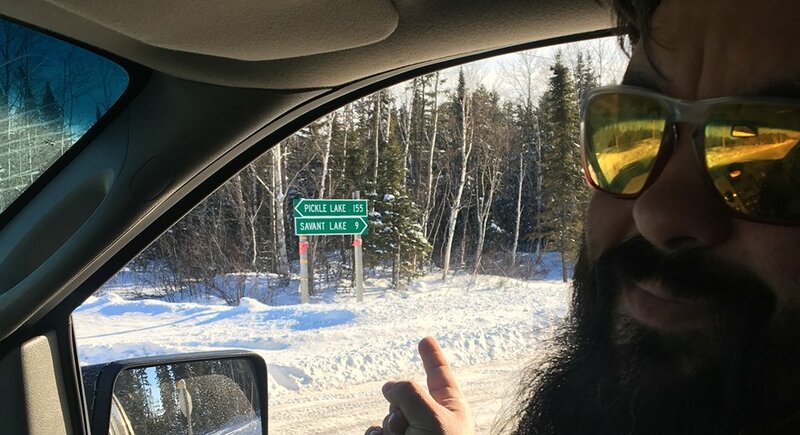 Tyler pointing towards a signpost they followed towards Pickle Lake 155km away. There were a few wrong turns, direction debates, thoughtful beard pauses, and ambiguous intersections but we were prepared to spend the night in the truck if need be and wait for the Sachigo Lake First Nation convoy that was a day behind us. A signpost pointing north towards Sachigo Lake First Nation. Weaving in and out, up and down, through the frozen forests and icy marshlands some sections were rough, while others were as smooth as silk. Hitting the lake, we glided over the groomed ice-lanes, exceeding speeds of 90kms/hour. 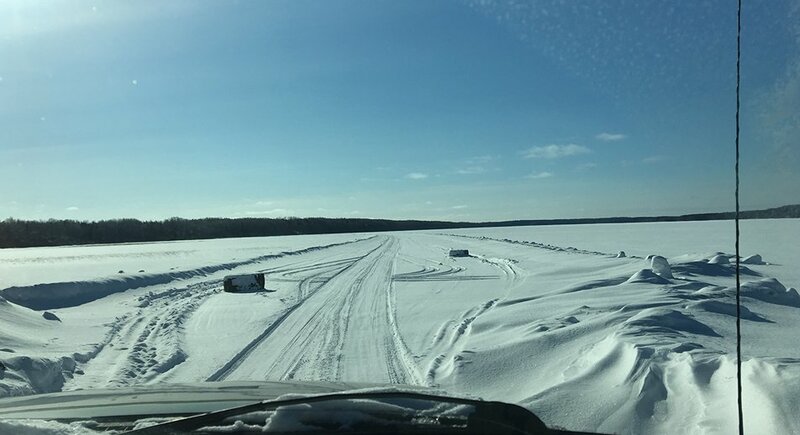 The view of the ice road as Deb and Tyler’s truck entered the Muskrat Dam lake. 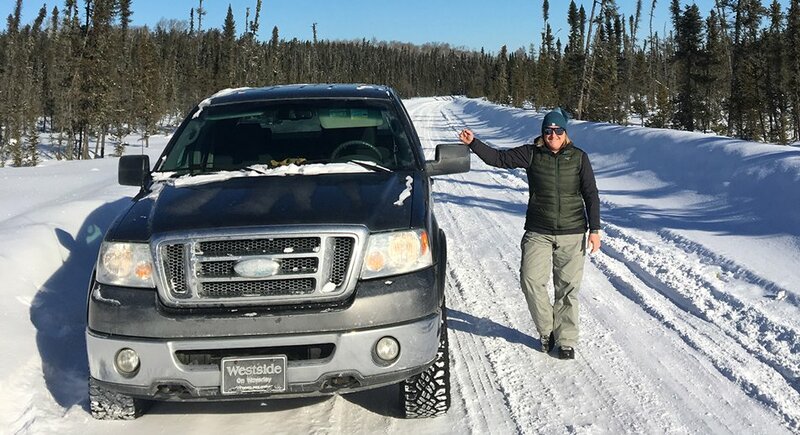 We stopped a few times along the way to ask for directions and were met with smiles, warm hearts, and surprise at two out-of-towner teachers who were driving the wild winter road, alone. They stopped in at the Muskrat Dam Lake First Nation fishing competition along the way, meeting up with friends. People we met helped and guided us back on track when we lost our way. We had faith we would make it and knew if we got into trouble we could reach out to our community of fellow teachers, also here with us in the North, for a place to rest. 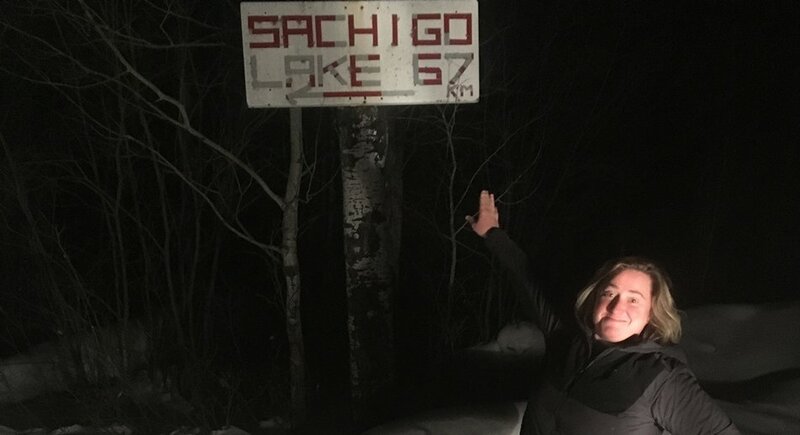 They knew they were getting close to home once they saw this sign for Sachigo Lake First Nation. After 12 hours on this ultimate wilderness adventure we arrived home; safe and tired. It was an experience we definitely plan to enjoy again – and now we know the way. Deb and Tyler made it home safe and sound after 12 hours on the ice road.